Raccoons are found throughout most parts of the United States and southern Canada. They also occur in South America i.e. from Mexico to its northern areas. Apart from the U.S., they were also introduced in various other continents i.e. Europe and Asia. Now let’s take a deep dive into the animal’s range and habitat and find out where do raccoons live in United States, Canada, Europe and other parts of the world. Raccoons are native to the United States. They are normally found throughout the continent, except for few states. Apart from Procyon lotor (North American or Common raccoon), the remaining six species occur all over Central, South and North America. Besides, they are also found in the Caribbean Islands. The common raccoon is found from Canada to Panama. Outside the United States, raccoons were introduced in various countries across the world. In the 1930s, the Soviet Union and Germany imported these mammals. Some of the other European countries where they occur today include West Germany, France, Luxembourg and the Netherlands. Today, the largest number of raccoons in the world (outside the U.S.) exists in Germany. In Europe, the German city called Kassel (at the northern Hasse) holds the densest population of raccoons i.e. every square kilometer hosts 50 to 150 raccoons. Likewise, they are also present in good numbers in northern France. In Asia, they were successfully introduced in Japan as well. 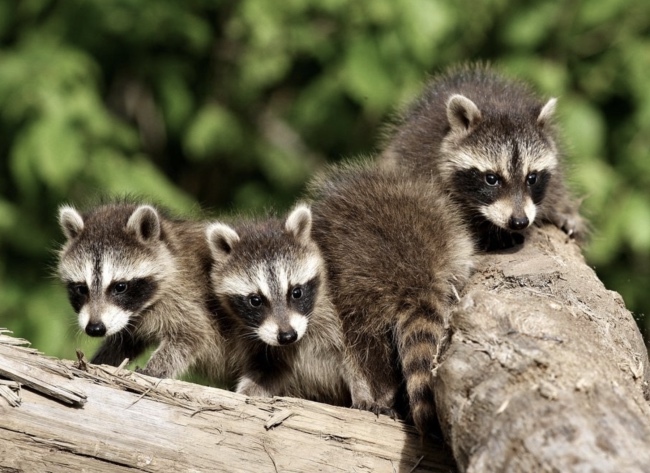 In Canada, raccoons live throughout the country, except Labrador and Newfoundland. With time, as more and more area is cleared, the range of these mammals expand toward the north. Raccoons do not restrict themselves to any specific habitat. Instead, they often occupy variety of habitats thanks to their ability to adapt perfectly to the surroundings. Since raccoons are extremely adaptable animals, they tend to occur in grasslands as well as tropical areas. Moreover, they are one of the few animals that also thrive on urban settings, including farmlands and suburbans. These mammals inhabit swamps, forested areas and agricultural lands. Normally, they den in abandoned holes of trees and attic of urban houses. But they are mostly found living near ponds in moist woodlands. Like us, they also require water, shelter and food sources to occupy any habitat. However, they usually prefer living in floodplain forests, marshes and hardwood swamps. They can also thrive on prairies and farmlands. The range of these animals expands with the availability of food as well as growing number of people in a particular area. In winter when the food is in short supply, they move back to their dens and sleep for longer periods to conserve energy. The specific kind of habitat also determines raccoon population in a certain area. In agricultural areas, there are almost 5 to 10 raccoons in every square kilometer. On the contrary, each square kilometer in urban areas holds up to 100 raccoons. Generally, raccoons do not prefer living in the open terrain. The winter denning of these mammals occurs mostly on hollow trees and logs. In places where such dens are unavailable, raccoons live in abandoned burrows of other mammals. They seem to have little fear of humans which is why they usually settle in urban areas. In Canada and the U.S., they are present in suburbs like Toronto, Washington and Chicago. They are also found in Albuquerque, a city in the state of New Mexico. In the cities, the denning sites of raccoons occur in the nearby forested areas. Since raccoons are nocturnal animals, they are rarely visible in daytime. For that reason, most people are curious about where do raccoons go during the day? Do they go to sleep in daylight hours or remain active and search for food all day long? The fact of the matter is, raccoons spend most of their daytime in their dens for obvious reasons i.e. nocturnal mammals are most active after dusk. That being said, some mother raccoons are however visible even in daytime. This is because a mother raccoon needs more nutrition to nurse babies in her den. Therefore, she forages for more food during the day. 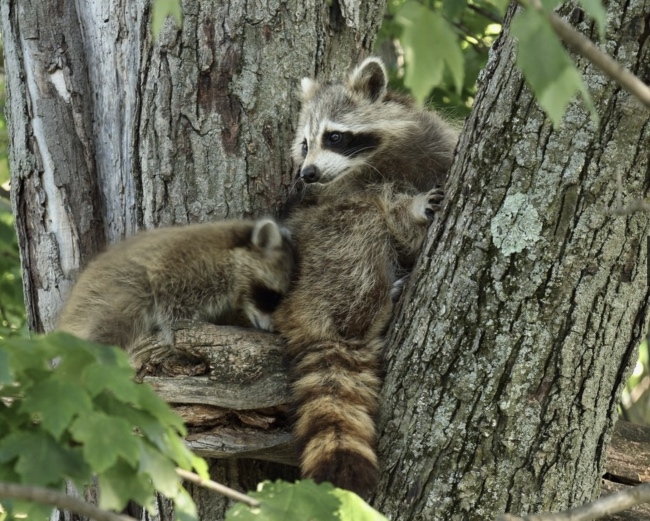 Some of the favorite sites where a raccoon usually dens are tree hollows, logs and rock crevices.